Hello loves!! 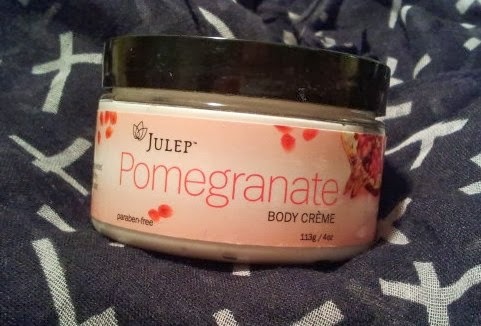 This is just a quick review of Julep's Pomegranate Body Creme. I received this cream in one of the Julep mystery boxes I ordered a while back. Julep is a cosmetics company that mainly focuses on nail polish but also offers other products such as mascaras, skincares products, hair products and more. You can order directly online or at one of their nail parlors, or you can sign up to be a "maven" and receive monthly boxes. They also offer themed mystery boxes every now and then which are a really great bargain!! Check them out here. The texture of this cream is extrmely thick and rich, great for very dry areas and for hands during winter!! It smells like a very sweet pomegranate. The cream is quickly absorbed and feels quite hydrating. I also like the little jar it comes in; very simple and cute with the big font and pomegranate picture. 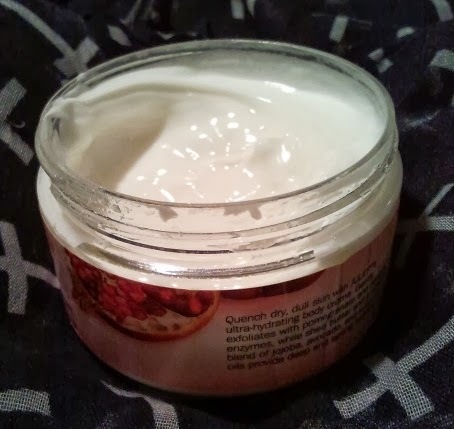 This pomegranate cream is retailed at $18.00 USD on their website. I'm not sure I would have ever tried it at that price, it's only a 4 ounce jar!! But I'm really happy to have received it in my mystery box. The mystery boxes are $25.00 plus shipping, and you receive 4 polishes and a few surprises. That being said I received this cream for a steal!! !